Receipts! I suggest you all get a box, or a basket, or a folder, or a giant envelopes or a jar and give a place to all receipts! 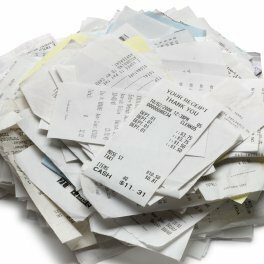 Each time you come home, take the receipts out of your purse, bag, pocket, or wallet and put in that designated place. The main goal is to keep all receipts together. Then either at the end of each week or month go through and organize them. I have a spreadsheet and I enter them in. I like spreadsheets because you can set it up to continuously add up your number so you know at at moment how much you’ve spent. Also you can create many categories. My tax man says electronic is the way to go. Or you can have a ledger and write them in. (I used to do both.) Some people don’t trust technology to hold their records. Either way you have organized records. I am realistic that not everyone can do the entering every day or every time they spend money. So again, the goal is too keep all receipts you need for your taxes NEXT year in one place and not lose anything. It will save you time later trying to locate a certain receipt too.